I was driving up A1A near Boynton Beach, FL, behind a SAG wagon covering the Boca Raton Bike Club’s Frank Stark Ride when I saw the last rider in a group hold up his hand. The SAG driver must have missed seeing him, so I did a U-turn, pulled up alongside the rider and asked if he needed help. He said he needed air for a low tire. He had flatted and changed the tube, but his CO2 cartridge left it more more flat than filled. I whipped out my ever-faithful Blackburn TPS-2 Bicycle Floor Pump and watched him pump away. Just before pulled back on the road, he noticed the sidewall bulging out. The tire bead hadn’t seated properly. Pssssssss. Deflate the tube and try again. This time it looked good. He pumped. And he pumped. And he pumped. “Wow, this is a lot of work,” he said as he put all his weight on the handle to get it to 119 psi. At 120 psi, there was a loud bang. It wasn’t the tube. The hose on the pump had blown. The rider was mortified. Knowing that Blackburn had been good about honoring their lifetime warranty when I had problems with the pump head, I told him not to worry about it. If Blackburn balks at replacing the hose, I’ll do a followup posting. Otherwise, assume that they are a good company to deal with. 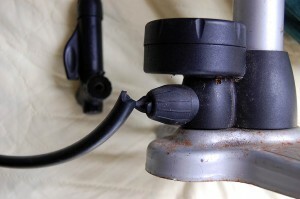 After four or five years, my Blackburn floor pump developed a problem with the Presta side of the head. I called the company and without so much as a hesitation, they said they’d mail me a complete baggie of replacement parts. A couple weeks later, I got the baggie and fixed the head unit. That was at least three years ago. I don’t remember what I paid for the pump but it was about $20 more than the other pumps. Given their repair policy and the fact it is about eight years old, I feel as though I got my money’s worth. That was exactly my experience. That’s why I didn’t shed real tears when I heard the hose blow. 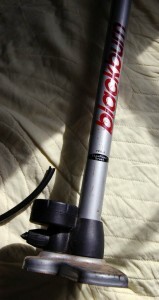 I have to admit, though, that I liked the looks of a Topeak floor pump one of the wrenches had. It has a “smart head” that accepts either type of stem without having to dink around with a hydra head. As long as Blackburn can keep pumping life into this one (pardon the pun), I’ll resist temptation. Sounds like the beginning of a good bidding war between Blackburn and Topeak. Send them this blog entry and see who ships you what first. I’m sure I’ll be hearing from Blackburn any minute. I emailed them my sad tail of woe this morning asking if I needed to send them the whole pump, just the hose or if my pictures would do the job. Like Matt said, they didn’t require the old parts to be returned the last time around for either of us. If I need the pump in a hurry, I’ll see if the blown part can be cut off and I can work with a shorter hose. Fortunately, it was close to the pump end, so I didn’t lose that much length. My Surly Long Haul Trucker tires only need about 50 or 60 psi, so I’ll be OK as long as I keep high-pressure roadies away from it. Wednesday July 15 update: No word from Blackburn’s help desk yet, so I sent a follow-up email. Bummer about the the pump. I hope Blackburn comes to the party for you. Do keep us posted please. I have a computer that I suspect will be going back to them. On the subject of the pumping, it sounds like the pump was not connected to the valve properly. One should get a good “easy” push down on the handle. If it feels like it is pushing back (does that make sense?) then it would likely to be not connecting properly, hence causing a blow back into the pump. A couple of folks have suggested the pump head wasn’t seated properly. I put it on the valve initially and it worked fine. When he found that the tire wasn’t on the rim properly and he inflated it himself, it is possible that he didn’t get it on the valve the right way. The mystery is that the tire was rock-hard when the hose blew, so quite a bit of air was making it past the head. My experience has been pretty binary: either it works or it doesn’t work. I don’t recall it “kinda” working. Today is July 18. I tried calling Blackburn, but they are closed on the weekend. “I sent the following messages on July 13 and July 15 with no response. “Since then, I’ve been documenting Blackburn’s lack of response. “If I don’t hear from someone by Tuesday, I’m going to buy a Topeak pump and write a review explaining why I switched brands. Steven again. Thanks for letting me trash your pump. If you are unable to get it repaired know that my offer to replace it still stands!!!! Thanks for assisting me on the ride, you are one truly good Samaritan!!!! It lived a long and productive life. If it hadn’t been you, it would have been me sometime when it was less convenient. I’m glad it blew when the tire was full and not earlier. It was nice to meet you on the road. Don’t worry about the pump. I called Blackburn’s support number at 10:06 AM and was told that my call was important for about 13 minutes. A very nice woman, Courtney, answered and said that they were behind in reading their email. I described my problem, she asked if my pump had a T-shaped head and then told me that a replacement hose wasn’t available anymore. I asked what Blackburn was going to do about my lifetime warranty. Sounds like a pretty good deal, except I wonder how that squares with “lifetime.” I guess it really boils down it has a lifetime warranty that expires when the pump does. The new one should be here in seven to 10 days, she said. Hi Ken, my TPS-2 blew out in almost exactly the same fashion as yours last night. I googled a bit and found your entry (I already follow your blog quietly) and a few others. Called Blackburn this morning and, after a very short hold, was also promised an Air Tower 2. This evening, I got to wondering if I could goop up/seal the hose on the TPS-2. Looking carefully at the valve end, it appeared that perhaps I could dig out the old rubber and then cut the remaining hose and goop up the entire assembly. It only took a couple of minutes of picking at the old rubber when it came loose from the barb fitting contained within the valve handle. I cut the remaining hose, as mentioned and reassembled everything. At first it worked but leaked a bit from thumb-tightening the knurled knob. After tightening that a bit with pliers, the pump is now working perfectly. So, if you or any of your friends (or readers) still have the old pump, it might be worth a few minutes to see if you can resurrect. I’m pretty pleased to have a backup to the soon-to-arrive Air Tower 2!